When we were little I remember being excited about Eid. The new clothes, staying up late, going for the eid prayer, henna on our hands meeting friends and let's not forget the best part Eidi. Which we would spend on whatever we wanted. But I don't remember being very much excited about Ramadan, yes we were excited cause some special programs were coming on the Saudi channel 2 like Full house, Crystal Maze I think American Funniest home videos was one too. Cause that was the time of no cable, internet or any other entertainment. When I think of that time, and when I see my kids or todays kids in general I don't see them getting excited about the programmes even. 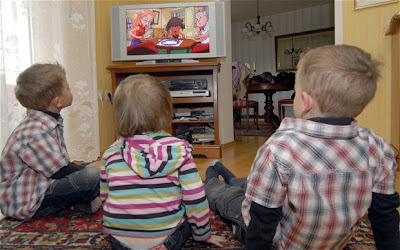 Cause most of the time they are not watching the tv in the first place. They r either on the ipads, phones, laptops, or the cartoon channels that doesn't change there schedule for Ramadan, so however wrong our excitement for Ramadan maybe, I don't see the kids getting anything now. They don't see much change in their routines, or even our routines. Cause sadly in Saudi most of the families have a general routine of getting up late and staying up all night, which becomes much more exaggerated in Ramadan. Yeah the parents might be praying more, or reading more Qur'an or doing qiyyam all night. But are our kids watching us when we are doing all that or are their eyes still glued to all those screens I mentioned before? We and our kids, being slaves to the gigantic (the bigger and smarter tv) and smaller screens is an entire different post I would attempt to write, once I become free of those things myself In Shaa Allah . 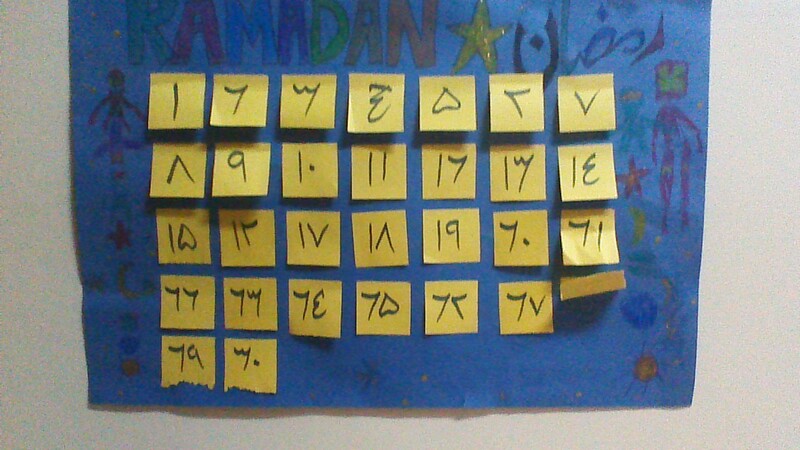 What I want to share with you today is my attempt to make Ramadan special for my kid. And not in the way it was for us when we were little. But in a more productive manner. What I want to do this Ramadan and hopefully keep it up, is make it festive, celebrating it everyday, doing something special with my kid almost everyday. I want to make Eid the biggest celebration in the entire year for him. I want him to forget his birthday and remember eid as the day to celebrate. Hopefully I will be able to accomplish this with Allah's help and the prayers of my family. So, in this regard I will post from today, I know I am starting a little late but I will try to overcome my laziness, and post our daily activities. So the first activity we did was make an Ramadan advent calendar with Arabic numbers written on them. I know the numbers are written wrong, I have to correct it yet. Anyho, you get the picture. the activities for each day are written under the yellow tabs. I will be listing the things we do from now on. 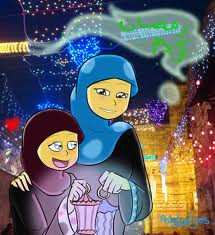 Do share what you are doing with your kids to make this Ramadan special and important in their lives.